When Jayavarman VII broke with Khmer royal traditions by following Buddhism, he chose a form of the faith that allowed many new ideas to permeate Angkor’s society. 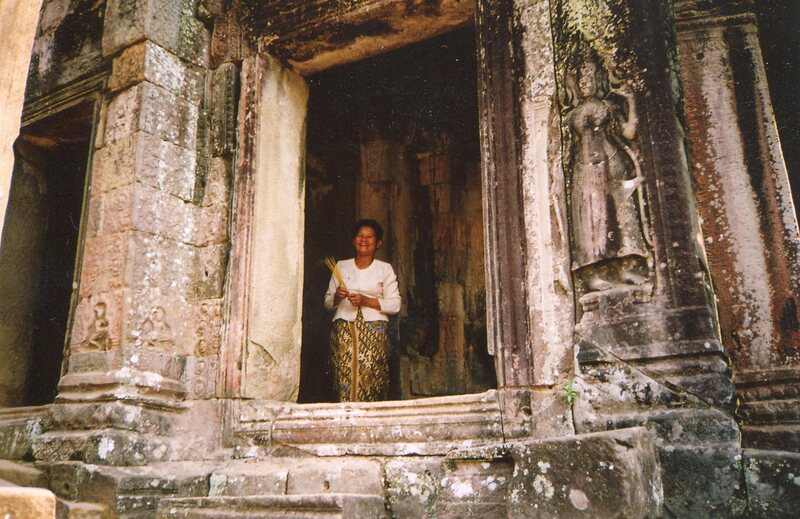 Khmer civilization in its heyday synthesized a big range of ideas to integrate itself. You can see these mixtures in Jayavarman’s great temples. But first, we’ll learn a little more about the big man. 1. Mahayana Buddhism emerged in northern India and central Asia around the beginning of the Common Era. Mahayana means great path, and it distinguishes itself from the Hinayana (lesser path–but its followers prefer the term Theravada, or the elders’ path). The Theravada tries to follow the Buddha’s original teachings, which focus on living a simple and balanced life in order to attain a better rebirth, and ultimately nirvana (release from the cycle of births). But Indian and central Asian religious imaginations were too prolific to stop at mundane daily life (you can also explore Indian culture). The Mahayana broadens Buddhism’s view of the vehicle for liberation–it extends from the Buddha to all of humanity. Other souls, called bodhisattvas, have earned liberation, but they’ve delayed it until all souls are liberated. Thus the universe is populated with many divinized beings. Ordinary folks thus have a big choice of deities to pray to for help in their daily lives. Higher flying mentalities can note that all people can elevate themselves and become bodhisattvas–all people contain the Buddha-nature. Everyone’s already a Buddha, but most don’t know it yet. So different people have been attracted to the Mahayana for different reasons. Because of the faith’s conceptual looseness, Jayavarman VII could fuse his own identity with a Buddhist deity. 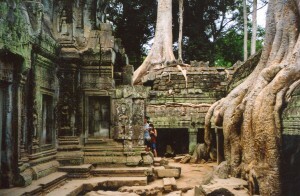 In the picture above, one of Jayavarman’s temples, Ta Prohm, and the jungle are in a slow-motion wrestling match. He began a construction binge that seems maniacal. This might have been motivated by the Cham wars and the recent Khmer succession crises–a new beginning validated after the traumas by its own super-human scale. 1. Public works, including irrigation projects, roads, bridges, hospitals and rest houses along roads. 2. Temples to honor his parents. 3. 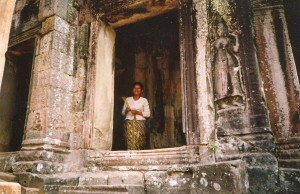 Jayavarman’s own royal cult temple, the Bayon. These stages coincide with the three types of constructions that Khmer kings established back in the 9th century, like Indravarman I. But the spectacular scale of Jayavarman’s projects, and the infusion of new ideas from his religion, made them some of the world’s greatest monuments. We’ll explore the most fascinating temples in the next few posts on Angkor. Saint or Caesar? Some of both. He built hospitals and rest houses, and thus brought the Buddha’s compassion to the Khmers. But thousands had to labor under the scortching sun to build them. Some historians have seen this as a contradiction, but the Mahayana allowed Jayavarman to be both tender and autocratic (he could identify himself with a divinity). 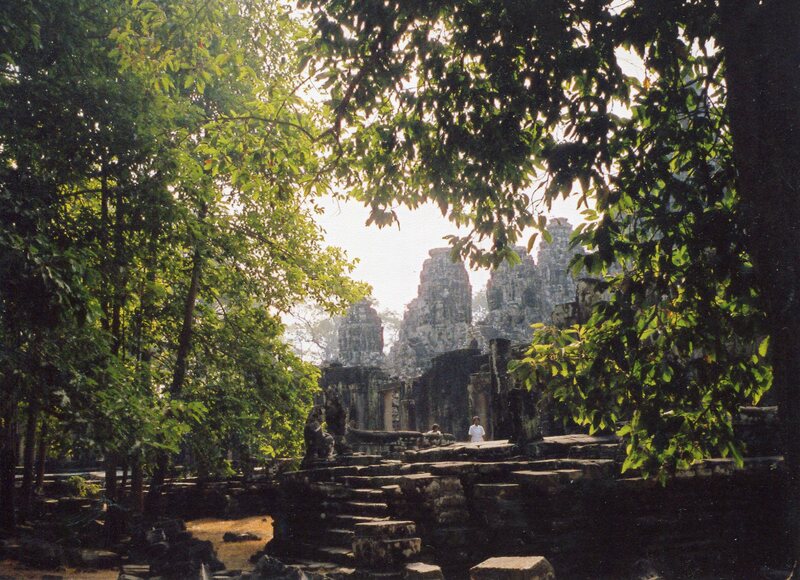 His monumenets have a lot of symbolic meanings, and like Angkor Wat, they have both personalities. Lucky for us–they give us a lot of material to explore. Previous post: Angkor’s King Jayavarman VII, A Khmer Saint Or Caesar?